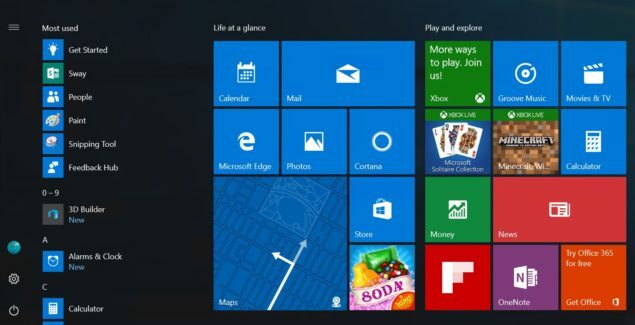 Microsoft showcased an improved Start menu at its Build developer conference. Following the conference, the company also released some details of the overhauled Start Menu, asking for feedback. Going to be a part of the Windows 10 Anniversary Update, the improved Start Menu will be released to Insiders on the Fast Ring in the upcoming Windows 10 PC Preview build. If you have been waiting to try the new Start Menu that Microsoft talked about a few weeks ago, the next Windows 10 PC Preview build is reportedly bringing it to you. According to a report by Winbeta citing sources familiar with the matter, Microsoft is done with the internal testing of the Windows 10’s improved Start Menu, and the feature is ready to be rolled out to Insiders. Internal rs1_release builds now feature the new Start Menu, meaning internal testing is now done and the company is ready to flight the new changes out to Insiders. Windows 10 Anniversary Update will be released to public this Summer, reportedly in July. Before that, Microsoft wants to test out all the new features and improvements and send them to Insiders for further testing and feedback. Insiders have been excitedly waiting to try out the improved Windows 10 Start Menu since the company showcased it in March. Microsoft’s Gabe Aul tweeted yesterday that we might see a new PC build coming this week. However, he later on said that due to a problem new Windows 10 PC Preivew build is now delayed until next week. While we can’t expect it to be as big as the last Windows 10 PC Insider build 14316, there is at least an improved Start Menu to look forward to.